There are two main styles of washing machines: top-load and front-load. If you’re looking for a smart top-load washer, your best bet is this high-efficiency model from GE. With 5.0 cubic feet capacity and a variety of advanced features including Wi-Fi connectivity, this top-load washing machine will make laundry day easier than ever. This smart appliance from GE has a stainless steel wash drum and meets Energy Star qualifications to help you save money on energy. It boasts “SmartDispense” technology to use just the right amount of detergent in each load, as well as Wi-Fi Connect, which allows you to control and monitor its progress with any smart device, including Amazon Alexa. Additionally, the top-load washing machine has settings for deep fill, warm rinse, auto soak, speed wash and more. Reviewers rave about this smart washing machine, noting that it can fit two loads of laundry in the spacious drum. Many note that the controls are easy to use, and the appliance makes laundry a mindless task. The only downside of this smart top-load washer is that shorter people may have trouble reaching the bottom of the drum when emptying out clothes — nothing a step stool can’t solve, though. Still can't decide on what you want? Our round-up of the best top-load washers​ can help you find what you're looking for. On the other hand, you can purchase a Wi-Fi connected front-load washing machine, like the Samsung AddWash High-Efficiency Front-Load Washer. This appliance gets top marks from reviewers thanks to its Wi-Fi connectivity, impressive capacity and other numerous features. The Samsung AddWash washing machine has a capacity of 4.5 cubic feet, and it features a diamond drum design that can extend the lifespan of clothing by treating fabric gently. The machine’s special AddWash door allows you to add forgotten clothing after the cycle has started — definitely a handy feature! Further, the appliance can be connected to your home’s Wi-Fi and remotely controlled from your smartphone or other smart devices. Finally, the Samsung washer is built with vibration reduction technology that reduces noise by 40 percent! This smart front-load washing machine has hundreds of 5-star reviews. Many people are impressed with how much laundry they can fit in the machine, noting that it doesn’t pull or stretch clothes. It’s worth noting that despite predominantly positive reviews, several recent buyers cite issues with the appliance leaking, though many say the manufacturer will repair it if it’s under warranty. You don’t have to break the bank to get a smart washing machine. 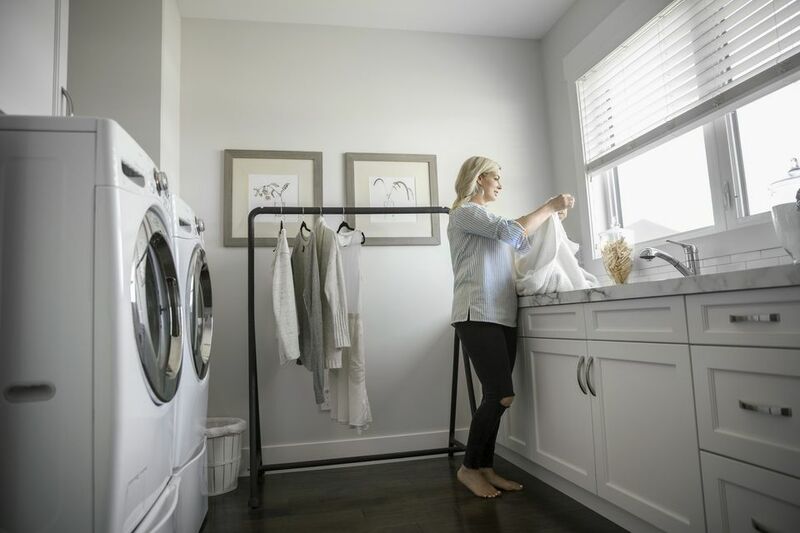 This Smart Top-Load Washer from GE can be upgraded to connect to Wi-Fi, and it receives top marks from buyers, despite its incredibly affordable price. The GE washer has a capacity of 4.5 cubic feet, and the top-load drum has a dual-action agitator that cleans clothes thoroughly while still being gentle enough for more delicate items. There are 14 wash cycles to handle various fabrics and levels of soil, and the appliance has settings like auto soak, deep rinse and speed wash. Reviewers say this machine is perfect for large families, as it can accommodate large loads of laundry and tackle heavy soil. This GE model doesn’t come with built-in Wi-Fi connectivity, but you can easily upgrade it with the optional GE Connect Plus part, which comes at an affordable cost. It’s a great option if you want the convenience of smart technology without buying a high-end washing machine. If you’re looking for a high-quality dryer that has Wi-Fi capabilities, the GE High-Efficiency Smart Electric Dryer fits the bill. This incredibly spacious dryer can be wirelessly controlled from your smartphone, and users are “blown away” by its top-notch performance. This GE dryer has a capacity of 7.4 cubic feet, and its Quiet-by-Design sound protection minimizes noise. It’s Energy Star qualified and boasts 14 care cycles to make drying clothes quick and easy. There are settings like sensor dry, extended tumble, damp alert and more—you can’t beat this machine in terms of versatility! Not to mention the dryer has built-in Wi-Fi so you can control it from your smartphone or other smart devices, including Amazon Alexa. Buyers can’t say enough good things about this smart dryer. Reviews state the appliance is quiet, efficient and very spacious. Many love that the dryer can determine the right drying time on its own and the smartphone notifications when the cycle ends is definitely a hit with users. If you prefer a gas dryer to an electric one, look into this model from GE. The smart dryer can be controlled over Wi-Fi, and its quiet cycles, spacious interior and energy-efficient design get rave reviews from users. This smart dryer has a capacity of 7.4 cubic feet, and it has an aluminized alloy drum that will resist chipping, rusting and abrasion. The appliance’s lint filter is in the front for easy cleaning, and its Sensor Dry feature takes the guesswork out of drying times by sensing moisture in the drum. The GE dryer is Energy Star certified, and it has additional settings such as extended tumble, steam select, damp alert and more. Finally, the dryer has Wi-Fi Connect, which lets you control and monitor your laundry from anywhere with a smart device or Amazon Alexa. This model gets consistently high marks from users, who say it’s surprisingly quiet and especially efficient thanks to the fact that it runs on gas. Many note that it’s spacious enough for large loads, including blankets, and that the various features are incredibly helpful. Want a smart dryer, but don’t want to spend an arm and a leg? Check out the GE Electric Dryer, which has built-in Wi-Fi Connect. It may not have as many bells and whistles as high-end models, but this appliance will get the job done — without breaking the bank. This Energy Star-qualified electric dryer has a 7.4 cubic foot capacity and 14 cycle settings, including a “My Cycle” option for customized cleaning. It uses the sensor dry feature to detect moisture in the drum, and the steam select option allows you to set the number of garments being steamed for optimal results. Plus, the appliance has built-in Wi-Fi connectivity, so you can monitor and control the cycle from your smartphone, even if you’re elsewhere in the house. Reviewers say this GE dryer is user-friendly and incredibly efficient. Buyers say the machine is quiet and that the end-of-cycle smartphone alerts are a useful feature. Pretty great for a budget pick! Want to save money on your energy bill with an eco-friendly dryer? You can have all that, plus Wi-Fi connectivity with this high-efficiency dryer from Samsung. This appliance has a sleek design that will look sharp in any home, and it has amazing reviews from hundreds of happy buyers. The Samsung Electric Dryer with Steam has a capacity of 7.4 cubic feet, and it boasts a durable stainless steel drum. The appliance is Energy Star certified, and you can choose from 12 preset dry cycles, 12 additional cycle options and five heat settings. One major perk of this model is its eco dry feature, which uses 25 percent less energy in every load, saving you money. The Samsung appliance also has Wi-Fi connectivity so you can remotely monitor the remaining cycle time and receive alerts when the cycle is complete. Reviewers are consistently impressed with this dryer’s top-notch performance and numerous features. One user even writes, “I wouldn't doubt this thing can probably cook eggs and noodles as well.” Ha!